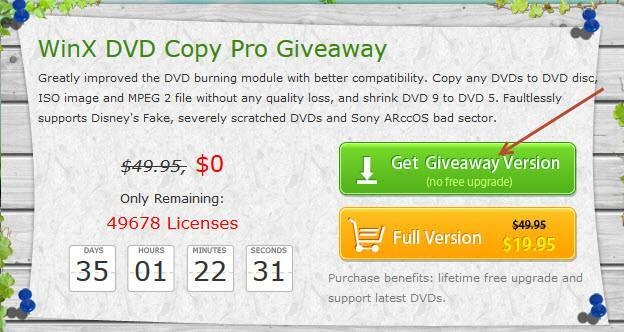 Digiarty is currently running a ‘Spring’ promotion which includes a giveaway of its very good WinX DVD Copy Pro software. WinX DVD Copy Pro would normally sell for $49.95us but is available free for everyone right now… offer expires after 50,000 copies or 10th April, whichever comes first. This will initiate a 15.1MB zip download which includes a text file containing your license code. Hmmmm…when I installed this special version and entered the registration code, I got a “registration successful” message. I also got a message stating this was a “time-limited special offer” and to get pay more to get the full version. Does “time-limited special offer” mean after a set time period the installed free version no longer will work? And why doesn’t Digiarty’s promo material explain that the free version is apparently a scaled-down version of the full version? I wonder what features are missing? Does “time-limited special offer” mean after a set time period the installed free version no longer will work? No. It means the offer to get the software for free is “Time limited”, the offer expires on 10th April. The software itself, the version downloaded, will work forever. And why doesn’t Digiarty’s promo material explain that the free version is apparently a scaled-down version of the full version? I wonder what features are missing? Because the software is not a “scaled-down” version, it is the full featured version. The only missing aspects are no free upgrades (to future versions) and no free support – this is standard for giveaways. If you pay the bit more, you will also receive those additional benefits. Jim, I found there was a limit on how many DVD’s could be copied, it’s been a while now, so I forget the amount. I uninstalled the programme. Jonno… that was then, this is now. As far as I am aware there are no limitations in functionality, I would be very surprised if there were. The program installed fine but it didn’t install the desktop icon I asked it to. Then when I tried to run it from the menu the password box popped up asking for an admin password. As I wasn’t installing it I of course denied this request. As that stopped the program running the only option left was uninstall. Why can’t these idiots write software that will run properly. Allowing anything other than installs and utility programs run with admin access is an invite to have your system trashed by viruses. Had absolutely zero problems installing here in a Windows 7 64-bit system Stephen, desktop icon and all. The only box which pops up on running is the standard UAC prompt. Many, many thanks to all concerned for this. Good on you Colin, it’s refreshing to hear from somebody who isn’t complaining about something for free. Digiarty produces nice software, and I’m sure this one would be no exception. Big thanks from me too!